On February 25, 1942, I was enlisted, sworn into the U.S. Navy at the Naval Receiving Station, Omaha, Nebraska. The weather was absolutely miserable, a cold bluster wind was blowing, and most of us were poorly dressed for the weather, but I made it. I was sworn in and was now an Apprentice Seaman , A.S., in V-6, the United States Naval Reserve – except we weren't in reserve. We were headed for God only knew, to begin our part in World War II. The morning following induction, hundreds, maybe thousands of us were loaded aboard old, decrepit, passenger cars attached to old coal burning, steam locomotives. The train, loaded with Army, Navy, and Marines chugged out of Omaha, Nebraska. We did not have the faintest idea where we were going. It could have been to the Great Lakes Naval Training Station or San Diego Naval Training Station. No one seemed to know and there was no one to ask. All we knew is that we were headed South. We stopped in small towns where we were allowed to disembark for a few minutes, to stretch our legs. At all of these stops, the train was met by crowds of locals who came out to welcome the train load of new servicemen. I don't know how they knew, we didn't know where we were. This train wandered all over the southwestern part of the United States. The only reason behind it, as far as we could reason it out, was that the government was sending us on some circuitous route as a safe guard against possible sabotage of the train. The one thing we hated about the trip was lack of air conditioning. You could not keep a window down because as soon as you put one down, a couple of people would open it again. The hot Southwestern winds blew through the cars, turning them into veritable ovens. And, the worst part of all, as we wound through mountainous desert country, we passed through one tunnel after another. When the steam, coal burning locomotive passed through a tunnel, the tunnel filled thick with black coal smoke from the engine. The inside of the cars rapidly filled with the same smoke and every time we passed through a tunnel we were covered with soot. It seemed like we spent about a week on that train, wandering around the Southwest before we finally arrived in San Diego. It seems like we stopped in many other God forsaken places where servicemen from the other services were taken off the train. On arrival at San Diego, US Naval Training Station, I was assigned to Company 174. I guess that was the 174th company to be trained there, so far in 1942. This, in effect, began my introduction into the discipline of regimented civilization. Looking back at my life in "boot camp," it is clear to me now that James Baker, Navy Chief in charge of my company, immediately spotted me as a proud, unbending potential problem who would require some extra guidance. I was immediately assigned to the task of cleaning the heads (toilets). I gingerly took the long handled scrub brush and delicately applied it to each of the toilets until I thought they were clean. Chief Baker then descended on me and wanted to know when I intended to clean these toilets. I said, "But Chief, they are clean!" At that, he took off his coat, rolled up his sleeves and proceeded to clean a toilet with a bar of sand soap and his bare hands. Then he washed his hands, put on his jacket and informed me, "That is the way you clean a head." O.K., I did as I was told, so pretty soon I was relieved of that duty. But, I still didn't get it. Every morning, we would be called out to muster before day light. Then, we would stand in ranks waiting for someone to come and muster us, that is, call out our names. After several mornings of this waiting, I decided this was a crock. I sat down on the curb and lit a cigarette. You guessed it, that was just what Chief Baker had been waiting for all those mornings. I was directed to his quarters, where he gave me a list of duties I would perform as punishment. At 1 a.m. every morning for seven days, I would report to the armed guard at the flag pole in back of the barracks with my rifle over my shoulder, bayonet attached, and my loaded, GI sea bag hanging from the end of the bayonet. Thus equipped, I was to march around the flag pole for four hours without stopping. If I stopped or slowed down at any time, the armed guard would poke me with his bayonet. I did this without a whimper, but I suffered. It was not long before the rifle had cut a crease in my shoulder about an inch and a half deep and I had several small lacerations from the armed guard's bayonet. In addition to the above punishment, I had to perform two hours of scrubbing floors in the barracks each night as my regular chores – and the war went on. Chief Baker it seems was trying to make a man of me. As evidence that I was not hated by him, he appointed me color guard for the company. That means that I carried the colors, the flag, on the parade ground all day. There were some breaks to our routine in boot camp. One thing we had to do was take some kind of tests to determine our suitability for schools and for placement in to the different parts of the Navy. One test lasted for approximately five hours. It reminded me a lot of the IQ. tests I had taken in college. At this testing, I was asked for my duty preference and for schools that I would like to attend. My first choice was Aviation Machinist's school. My second choice was Cook's and Baker's school. At the end of boot camp, I was assigned to the Hospital Corps school. As near as I could figure out, they trained you to go where they needed the most men. That was interesting, but just before I was to graduate, the night guard who came through the barracks at night saw me glowing in the dark, took my temperature, and found that I had a 104.2 temperature and was red as a beet. They immediately suspected scarlet fever and rushed me to the U. S. Naval Hospital, San Diego, where I was kept in isolation for several days until they found out I had bronchitis and a bad sun burn. Then, it was back to Hospital Corps School, where I had to start all over with the next company. Since this was my second time through the school, I got the best grades in the class and got to pick which base I would go to for further training . I had a choice of Corpus Christi, Texas, some place in Florida, or anywhere I wanted. I traded Florida for Mare Island, California, so I would be close to home. Mare Island was the least desirable place, so whoever I traded with gave me a hundred dollars to trade with him. At Mare Island, they lined us up and picked the largest men in the group for psychiatric duty. They lined us up and said “You, you and you to Ward 4.” Since we three were the biggest of the bunch we went to the violent ward. This was the top floor of the neuropsychiatric hospital. The patients on Ward 4 were, for the most part, considered incurable, violent, mental patients, who were housed here for study and for further transfer to other hospitals in the States. The ward consisted of thirty locked rooms with only a mattress, 15 rooms on each side of a long hallway. Across the back was one large room called a solarium. The solarium had fifteen beds, for the less violent patients. Forty five patients in all. This was Ward 4. On each fourteen hour shift, one corpsman was locked into this ward and was in charge of all of the patients. In case of an emergency, like an impending death, I could push a button at the gate across the rear of the hall and hopefully someone would respond from a lower floor. I won't attempt to go into detail about the patients. It is enough to say you had to have eyes in the back of your head. Some of them just liked to trick you, but many of them wanted to kill me. At or near the end of a fourteen hour shift, I was pretty exhausted and sometimes just lay down on one of the patients beds in the solarium and went to sleep. Someone of the more trustworthy patients would usually wake me if one of the doctors came to the gate. One of my more interesting experiences was waking up from one of these naps with a big patient trying to choke me to death. He was very serious. Some patients had one track minds. If they wanted to kill you, they thought of nothing else and weren't easily dissuaded. One day when walking down this hallway, something bounced off the wall by my head. It was a solid metal ball about two and one half inches in diameter. In those days we did not have aluminum foil, we had lead foil. Gum and other things came wrapped in lead foil. A catatonic He then threw that ball at my head, and if he had been two inches more to the right in his aim, I would have been dead. He was a most interesting patient. He appeared not able to move or speak. I would take him out of his bed in the morning and stand him in the doorway so he could see movement. Every half hour or so, I would have to move him around some to help his circulation. He is the one who threw the lead ball. Apparently, in the dead of night he would get in a corner of his room and work on his lead ball. A small, slight-built, balding young man befriended me about this time. He worked one of the other wards. His name was "Doc" Pemberton. Of course, we were all called "Doc." Nobody knew anyone's first name, so we were just "Doc"to each other and to the patients. Pemberton had worked for several years in the California State Psychiatric hospitals and knew his way around the business of caring for patients, which was a lot more than anybody else knew. The Doctors needed someone who could handle emergencies, so they chose him and he chose me as his partner. He taught me all the tricks of handling violent patients. We never received any special treatment for our work, but in the middle of the night they used to call us out to handle the extreme cases. For example, one night we arrived on the scene to find doctors, nurses and many corpsmen gathered at the front of the mental wards, in a state of near hysteria. A patient on Ward 3 had broken up a bed and was using a piece of steel bed frame to destroy his room. He had even beaten out some of the bars on the windows, he had beaten the door until it barely hung by its hinges, and it was sure death to anyone who tried to enter. I took a small mattress, held it in front of me and entered the room. The blows rained on that mattress were unbelievable, but I moved right in on him and cornered the patient. Pemberton went under the mattress, grabbed the patient's legs and pulled his feet out from under him, at which point my mattress and I fell on him and we subdued him. There was hardly anything left of the mattress afterward. It was torn to shreds, but they kept it to use in training sessions. Pemberton and I were unhurt and worked our regular shifts that day as usual. About this time, the Chief Psychiatrist in charge of Warts 1 to 4 called me in and informed me that the U. S. Naval Hospital at Bethesda, Maryland, had a special training session in Neuropsychiatry. He had written a letter requesting that I be sent there for further training. About a week later, I was sent to Napa State Hospital where the Navy had taken over two wards to treat and house patients who were being selected for further transfer to state hospitals in their home states. I never heard anything further about the training at Bethesda. Imola, as the Napa facility was called, was a most enjoyable duty for about six months, until a Chief Nurse, a Navy Lieut. Cmdr. by the name of Wamble came aboard. She took a very dim view of how I subdued the violent patients. She never took the pains to discuss it with me, but one time when I had to control a huge Paranoid Schizophrenic who had a butcher knife and was chasing members of the galley crew, I had secured him in a so-called "padded" cell. She and another nurse went in with him, were holding his head in their laps, stroking his brow and cooing to him. Hell, I didn't know he was theirs. I would have gladly called them to handle him. Soon after the incident with the paranoid and his knife, I received orders transferring me Headquarters, South Pacific Command, Noumea, New Caledonia. It all sounded romantic and interesting, and I would be going to war at last. Funny, but I was seven years old when Al Smith ran against Herbert Hoover for the office of President of the United States. This election was preceded by months of talk about the candidates. When you stop to think about it, general conversation was all there was then. I don't think we even had a radio at that time. The depression was falling on the country then and everybody we knew thought Herbert Hoover was pretty much responsible for it. On the other hand, Al Smith had captured the hearts of America. Finally election day came and I could not wait to find out what my parents did. Did they vote for Al Smith? When they finally got back to the Butte after having been gone all day to vote -- they probably went to Coal Springs to vote -- I rushed out to the wagon to hear the news of the day. "Did you vote for Mr. Smith?” I asked. When my parents said, "No, he could not have won and we didn't want to waste our vote, so we voted for Herbert Hoover," I was heart broken. Since my own parents didn't vote for Al Smith, I was resigned to his having lost the election. The United States then plunged in to the darkest depression of the Western world. Perhaps Herbert Hoover and Al Smith had very little to do with it -- but I was always convinced that life would have been OK if Al Smith had won. Editor's Note: With the inauguration Tuesday of a new President, it seems only fitting to revisit another election from days gone by and how it was perceived around Thunder Butte. 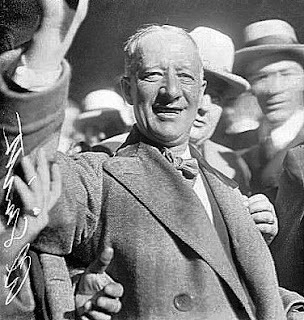 Al Smith, then governor of New York, was the Democratic presidential candidate in 1928. John Crowley was so affected by his loss that he has been a Republican ever since.